Gazpacho is a Spanish soup made with raw vegetables and served cold, usually prepared with tomato,this soup belongs to the Spanish region of Andalusia. Gazpacho verde is prepared simply with green apples, green capsicum,cucumber, mint, avocado and sometimes with spinach. My version went to green apples, cucumber, mint which makes a prefect marriage together. 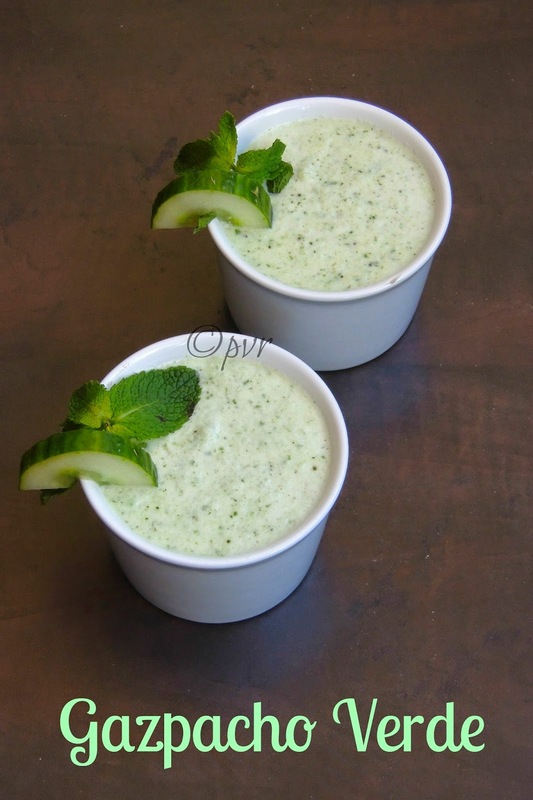 This green gazpacho can be enjoyed thoroughly while the weather is too hot, a prefect to enjoy during summer. Actually this raw vegetable soup goes under Low carb/No carb recipes. Whoever want to take low carb diets, can enjoy thoroughly this Spanish soup.Usually bread slices are used for making this soup, which helps to thicken the soup, but my today's green gazpacho goes green apple, low fat milk,green capsicum, cucumber, mint, obviously a low carb dish. Today am running my second week of blogging marathon with low carb or no carb diet as theme, this chilled soup suits prefectly for this theme. Serve it as a meal or as a part of a meal depending upon your wish. This green gazpacho is a light,fresh, cold soup suits prefectly to any ages and mostly for dieting peoples. Make this soup and enjoy the goodness of this chilled raw vegetables soup.Sending this post to Ahlan Ramadan-The Healthy Way.Check out the Blogging Marathon page for the other Blogging Marathoners doing BM#42. Sending to Pari's Only - Gluten Free Cooking. 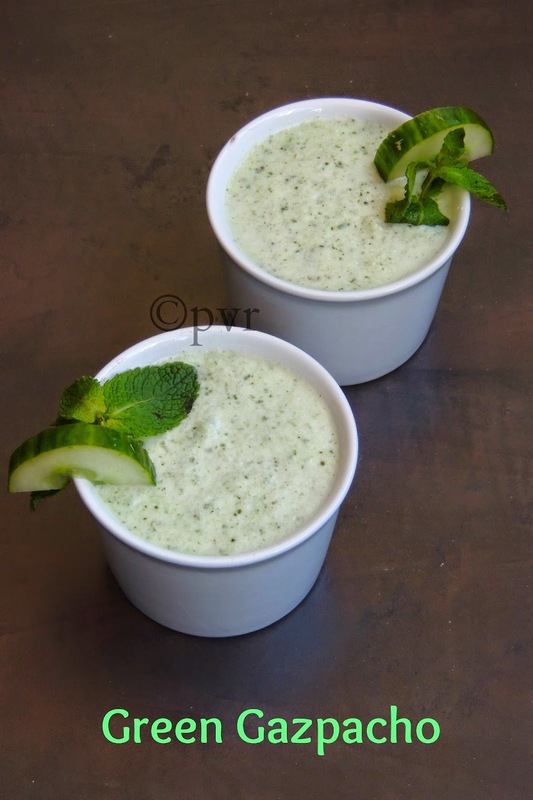 Blend together the cucumber, green apples, green bellpepper, garlic cloves and mint until smooth. Add the milk and blend again for few minutes, adjust the addition of milk as per your need. Arrange in fridge for an hour or two. Never heard of this looks so soothing! What an amazing combo..very different and interesting. Looks so perfect adding milk to this child soup is very interesting. Wow lovely Gazpacho.. I knw the one made with tomatoes. This looks awesome and so healthy. This is new to me but I am so tempted by the picture! Love the color too! This soup sounds delicious to me, love to try it! Nice variation to the regular tomato gazpacho. Looks very refreshing and tempting. Chilled soups are great for summer. Looks very refreshing. Lovely soup for the summer months. I am still very hesitant to try cold soups, but maybe my family would like this. Will give it a shot once the vegetables starts to grow in my backyard. Chilling recipe.. Love to have it in hot summers..
That's one refreshing soup for hot summer days. I have been eyeing this soup for quite sometime now.I hope to make this sometime this summer!